Do giants get bad backs? I recently launched a Facebook page for Chester & Liverpool Alexander Technique Studio. Searching around for an interesting cover photo, I found one taken in Regents Park (London) a few years ago. In the photo I was working with my ‘Alexander hands’ on the head and neck of a ‘giant’ who just happened to be lying there in what we call the semi-supine position – used in AT for resting, tension-release, and increasing your awareness of the body. The giant in the park was clearly doing his Alexander Technique semi-supine routine! Unfortunately, when the photo was taken I hadn’t made a note of the sculptor who created the giant, so wasn’t able to quote this when I first put the picture on. But yesterday somebody found it for me: it featured in one of the national newspapers in an article about the 2013 Glyndebourne Festival, 18th May – 25th August. So now I can give credit to its creator. 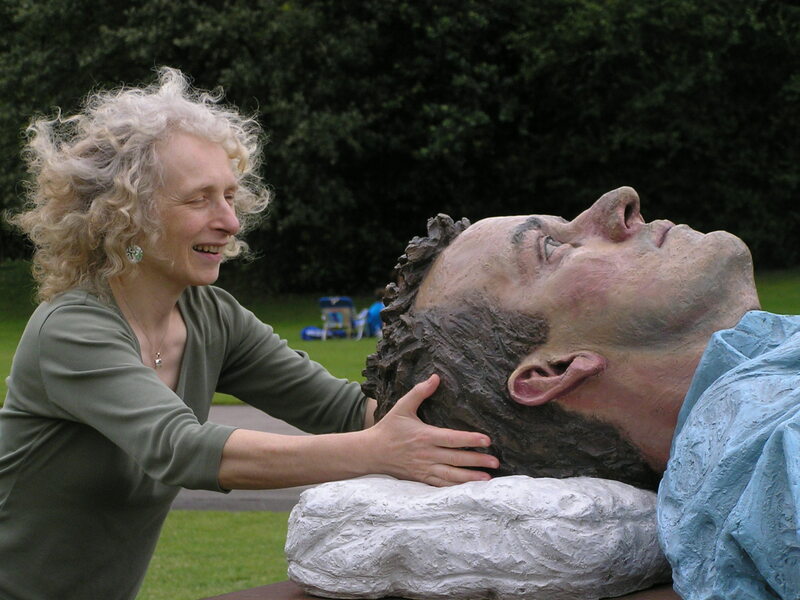 It is Sean Henry, who is exhibiting this and similar larger-than-life figures (the others are in more animated positions) in the grounds of the opera house, in Sussex, for the duration of the festival. The only thing that puzzles me is the giant’s name: ‘Catafalque’. Does this name have a meaning? Well, unfortunately, yes! According to my Oxford English dictionary, a catafalque is ‘a decorated wooden framework for supporting the coffin of a distinguished person during a funeral or while lying on state’. Surely not! Everything about him corresponds with the AT semi-supine: head slightly raised to align with the body; eyes open to remain visually aware; and most of all, the position of his knees! You can’t actually see this from my photo, but the giant’s knees are bent (which is why, in the Technique, we call the position ‘semi-supine’; whereas a corpse, of course, would normally be in a supine position! Examining the dictionary definition more closely, I suppose it is actually describing the structure on which the body is lying – rather than the body itself. So I remain convinced my giant was alive, just enjoying the sunshine in the park that day. And what of the Alexander Technique – is this dead or alive? Does it actually enliven those who take Alexander lessons? In my long experience with AT, it is both enlivening and life affirming – in a number of ways. Firstly, many of those having Alexander lessons feel they have more energy. This is probably a result of letting go tensions and effort they don’t need, leaving them feeling significantly less tired. Secondly, most ‘non-Alexander’ people have quite poor posture and alignment; which can result in backache, headaches, neck and shoulder pain, stiff hips, muscular tension, or a vague sense of general discomfort. Any of these aches and pains can be a barrier between the person and the pure, simple enjoyment of life! If Alexander helps remove these discomforts, as often it does, the individual is free once more to live and to experience life without such obstacles interfering with their perception. Thirdly, AT helps develop a quality of stillness, which we all need at times, particularly when our lives are too busy. And then there is the quality of increased awareness – but let’s leave that for another time!